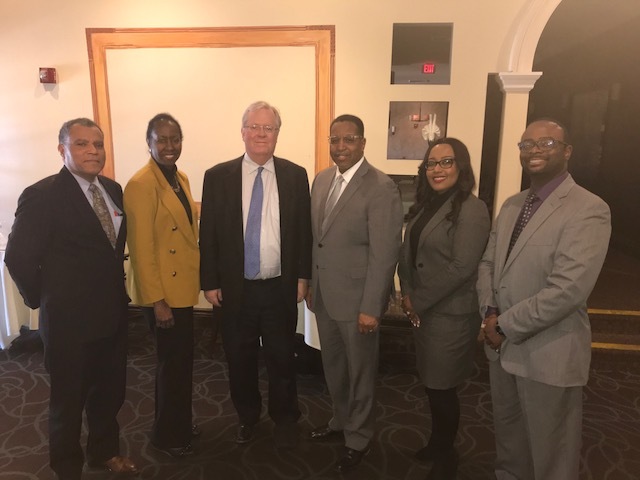 DETROIT— Lewis & Munday, a Professional Corporation held its 44th Annual Board of Directors Meeting on Thursday, March 22, 2018 at the St. Regis Hotel in Detroit. The Shareholders reflected on the challenges and accomplishments of 2017 and discussed the Firm’s plans for continued success in 2018. Ronda Tate Truvillion, who became a Shareholder in January, was welcomed to her first meeting by the other Shareholders (i.e. Reginald Dozier, Has Massaquoi, Blair Person, and Karen Kendrick Brown). The Shareholders voted to retain Reginald Dozier as the Firm President and Blair Person as Secretary/Treasurer. Lewis & Munday, P.C. was established in 1972 by African Americans and is one of the oldest minority founded law firms in the country. The Firm has a full-service practice that includes employment litigation, insurance defense, business law, real estate law, bond and municipal law, etc. The Firm’s clientele includes businesses, governmental agencies and entrepreneurs. Headquartered in Detroit, the Firm has three other offices in New York, NY, Washington, D.C. and Glastonbury, CT.